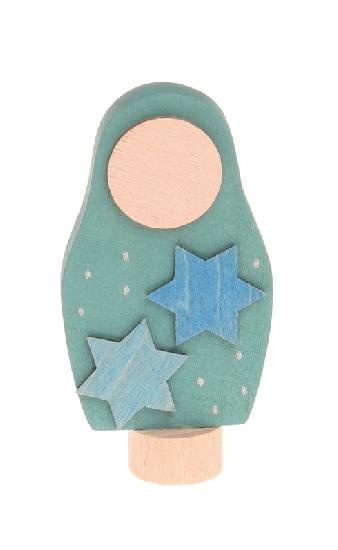 Decorative matryoshka with blue stars fits in any Grimms celebration rings. Grimms Decorative Figures are wonderful for decoration on our Birthday Rings, the Birthday and Advent Spiral and Lifelights. On a birthday table, a window-sill and on the nature table it creates a special atmosphere on each of the occasions. Materials: handpainted lime wood, non-toxic water-based colour stain. The Decorative Figures fit in all our Birthday Rings, and Lifelights.